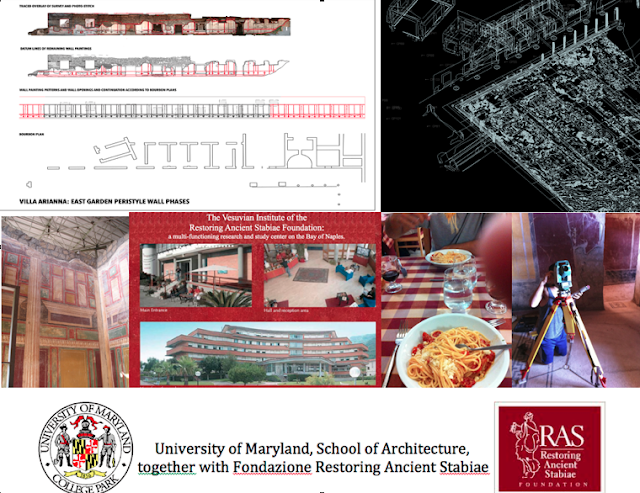 A three-credit course with transfer credit offered by the University of Maryland School of Architecture. Planning and Preservation focusing upon the ancient seaside villas of STABIAE in Castellammare di Stabia, Italy. This is a three-week course with one week field season at the end. The aim is to train students in a particular type of architectural recording for archaeology which combines techniques of hand drawing, photography, digital three-dimensional drawing and CAD post production preparation of final drawings. The goal is train students so that within one to two weeks they will understand the whole process and be able to participate productively in a fully active architectural recording team on the archaeological of the large Roman villas of Stabiae. At the conclusion of this course a successful student should be capable of being a valuable member of many types of architectural recording teams or assisting in the production of “as-built” drawings for architects. Requirements: open to undergraduates and graduates. Some preference will be given to students who have had some experience of architecture, or have an ability to draw, but also for those students in fields such as archaeology, classics and art history. Knowledge of trigonometry or CAD is not necessary, although students should be prepared to bring a personal computer equipped with a current version of AutoCAD, which can be downloaded free for anyone with a .edu email address, and Adobe Illustrator. The course will be housed at the Vesuvian Institute of the Restoring Ancient Stabiae Foundation in Castellammare (near Pompeii) and will focus on the archaeological site of the Roman villas of Stabiae. Program will incorporated visits and general introduction to neighboring sites of Pompeii, Herculaneum and Oplontis.